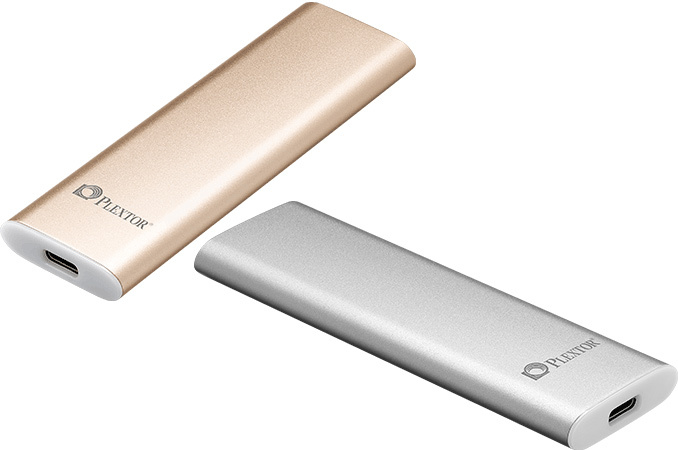 Plextor this week formally launched its first external SSD which it demonstrated back in early June at Computex. The Plextor EX1 combines low weight, high capacity, a high quoted performance with a USB 3.1 Type-C interface. Moreover, the manufacturer promises increased endurance as well as reliability due to an advanced SSD controller and even offers the drive with a five-year warranty. As reported initially, the Plextor EX1 SSDs will be available in 128 GB, 256 GB and 512 GB configurations. 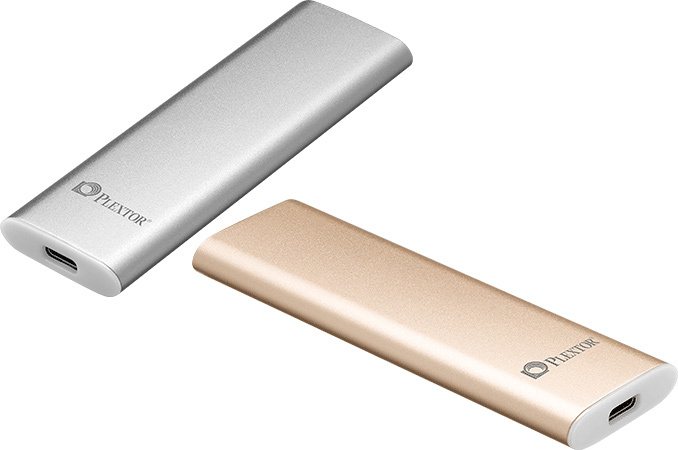 The drives will use USB 3.1 Gen2 Type-C interface with up to 10 Gb/s transfer rate and thus will be compatible with both currently available (via USB-C to USB-A adapter) and upcoming PCs. Since the EX1 is a fully-fledged SSD, not a flash drive, the compatibility with future systems was a requirement in the product design. Moreover, to emphasize that this is not a USB stick, the EX1 has a USB-C receptacle rather than a connector, which means that owners will have to use a cable to plug the drive into their systems (not very comfortable, but ensures that nothing accidentally breaks down as a result of careless usages). Plextor does not reveal a lot of details about the product, but claims that it uses a Marvell controller that supports LDPC error correction technology as well as PlexNitro feature (both technologies are used by Plextor in their TLC NAND-based drives), a VIA Labs VL716 USB 3.1-to-SATA bridge as well as Toshiba’s TLC NAND made using a 15 nm process. Since Plextor already has a working SSD platform featuring the Marvell 88SS1074B1 controller and Toshiba’s 15 nm TLC NAND (used in its M7V drives), it is highly likely that this platform served as the base for the EX1 as well. On the other hand, the EX1 has a longer warranty, but the same 1.5 million hours MTBF rating and similar general performance specs. Speaking of performance, Plextor claims that the EX1 is capable of up to 550 MB/s read speed as well as up to 500 MB/s write speed (obviously, when pseudo-SLC caching is used), which is in line with performance of the M7V SSDs and is faster than declared transfer rate of the Samsung Portable T3 SSD (yet, this one has considerably higher capacity). Nonetheless, keep in mind that the real-world performance of SSDs is typically lower than that specified. When it comes to features, the Plextor EX1 looks just like a typical SSD drive for desktop computers: it supports TRIM, NCQ, SMART features and relies on the ATA/ATAPI-8 protocol. The drive is compatible with Microsoft Windows, Google Android, Apple macOS and Linux, but with certain limitations imposed by different file systems. For example, Android only supports exFAT and FAT32, but not NTFS, whereas FAT32 does not support files larger than 4 GB. Meanwhile, exFAT is not supported by Linux. The Plextor EX1 drives come in gold and silver colored enclosures made of anodized aluminum, their weight is around 30 grams. The drives are not too small: their length is a little over 10 centimeters (~4 inches) and their thickness is approximately 8.7 mm (0.34 inches). Plextor plans to start selling the Plextor EX1 SSDs this month. Exact price points are unknown, but Plextor will also offer Fnet encryption software with the drives.